Quick, can you name the most dangerous roads in the OC? 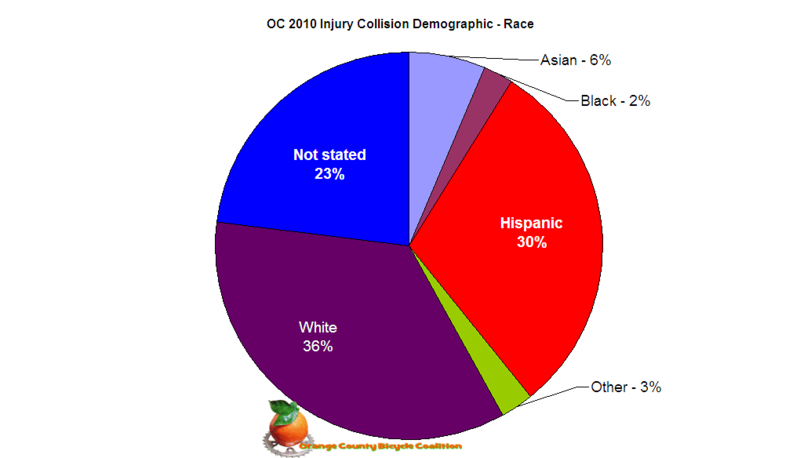 To qualify, the road must have at least 1 bike related collision in the last 11 years. Thanks to the blocked bike lane last month (surprise!) on northbound PCH before Warner, and the fact that the k-rails were still there this week after work was completed, we thought we’d take a look at roads and bike collisions in the OC. to see if perception matched reality. Since CalTrans failed to notify the cycling community before the lane closure, and failed to remove the barriers in a timely fashion, we could wail about the injustice of it all, but we won’t. We also wonder what else is going on about the county putting bike riders at risk. If you see something, send us a short note (anonymous if you’d like), and we’ll follow up on your tip. Thanks! 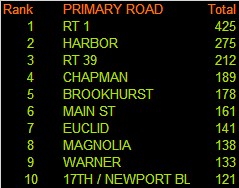 As seen, RT 1, or the Pacific Coast Highway leads the contenders so far at 331 bike related collisions. We are only counting collisions without regard to death or injury at this point; an aggregate total count if you will. The road travelers among you know some of these roads go through many cities, and some might even change names as they do. What you might not know is spelling prowess is lacking in some of the records reported to the CHP, and some roads have various derivations. For example; BROOKHURST ST is #7 on the contender list, yet in the database there’s also BROOKHURST, BROOKHURST RD, SOUTH BROOKHURST ST, N BROOKHURST ST, SOUTH BROOKHURST S, NORTH BROOKHURST, NORTH BROOKHURST ST, S BROOKHURST, S BROOKHURST AV, and let’s not forget BROOK HURST (space between). I’m sure you get the point, so might Brookhurst move up to earn the title of “Danger Road”? Care to guess? Have a favorite? Let us know your choice for top “Danger Road”, winner gets to ride it at their own risk. When we open the envelope with the winner, we’ll either update this post or create a new one. A tie for 10th place at 121 collisions as 17th street moves up to equal the number of collisions on Newport Blvd. 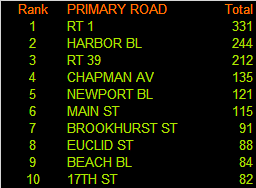 The overall “winner” at 425 collisions is RT 1, aka Coast Hwy, PCH, W Coast Hwy, E Coast Hwy, Pac Cst, and all the other names for this road in the database. Yes, we went through line by line for all the roads including Brkhrst, Brookherst, and all the others to arrive at this list. With 150 more collisions than any other road, PCH (or RT 1) travels the length of the county, so perhaps it shouldn’t come as a surprise given ridership, traffic, and the probabilities inherent in the mixing the two. Newport Beach is clearly above all others and not in a good way which is one of the reasons we support local efforts to improve cyclist safety in this city. We’ve documented (and mapped) plenty of Newport related items and issues which you may find here. We also thank all those that turned out for the NPB Memorial Ride and Fundraiser last October. With 9 riders killed and 442 injured from the above 425 collisions, the chart below attempts to discern any seasonal effect in collisions. 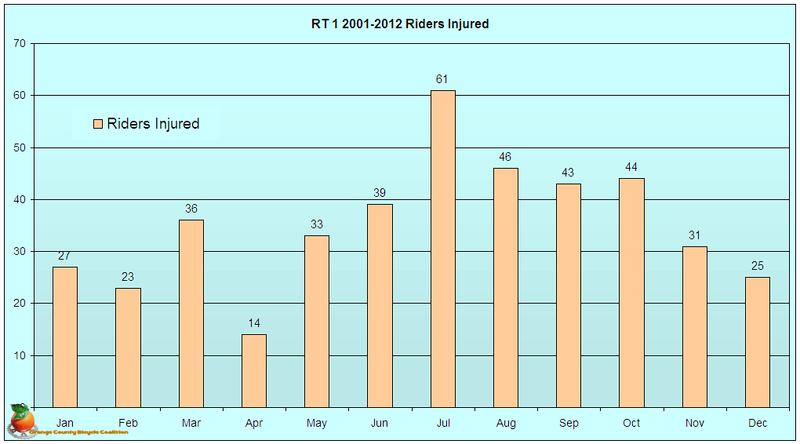 One would expect greater numbers of riders in the summer months, and the chart shows the highest injuries happening in July and decreasing into the winter. The high count in March may be weather related due to unexpected rain and road conditions. Collisions and injuries are not a 1:1 proposition. Sometimes there are more than one person injured in a collision and sometimes no injury is reported from a collision, hence the difference in numbers between collision and injury counts. 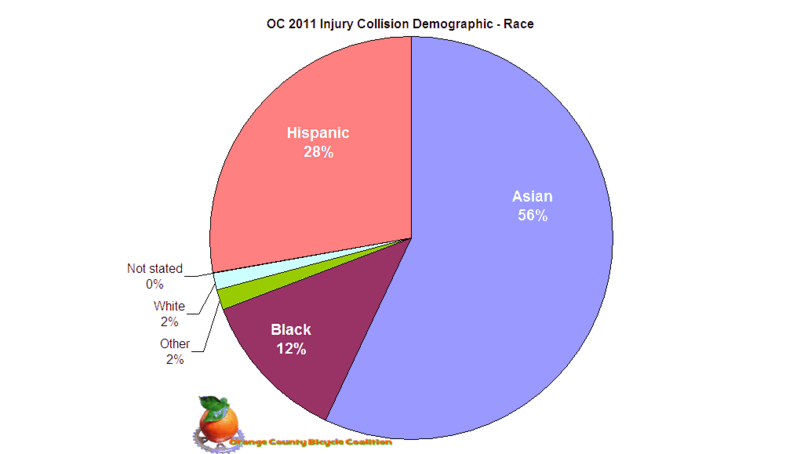 The complete breakdown looks like: 462 total injuries from 425 collisions involving people on bikes. 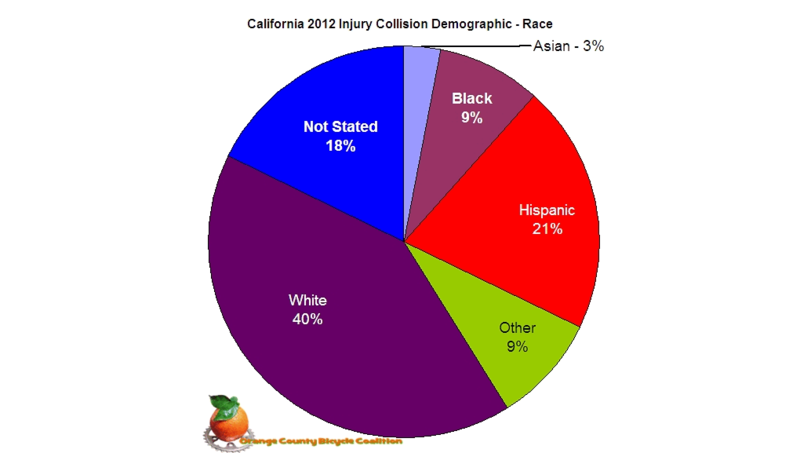 442 bike riders, 6 motorcyclists, 3 pedestrians, and 11 drivers were injured during this reporting period ending the 3rd quarter of 2012 with the most recent entry to the CHP database dated 7/28/12. Nine bike riders are dead as a result of collisions with no other fatalities recorded for other road users. With your continued support, we aim to identify, notify, and assist in reducing ridership collisions. As one of 83 cycling events in 43 states for diabetes, join over 250 riders as the OC Tour de Cure takes place this Saturday 9/29/12 in Aliso Viejo and Laguna Niguel. The fundraiser supports nearly 26 million Americans with diabetes through the American Diabetes Association. There are 3 road and mountain routes to choose from, or bring both bikes and ride one of each! A bike corral will hold your extra bike while you are out riding. Choices in distance vary from 6, 20, and 50-ish miles for the road, while mountain riders may choose from 5, 10, and 25 miles. The start line is located at the LDS parking lot at 28291 Alicia Parkway, while the finish line and and Tour Village is located at the Wood Canyon Elementary School at 23431 Knollwood in Aliso Viejo. With online registration now closed, the OC Tour de Cure passed its goal of $60,000 and is just shy of $1,400 of its new target of $80,000. You may sponsor a rider, or make a direct donation to the event from the website. Please be aware, and respect others on the trails, paths, and roads. For additional information please e-mail Heather Erickson, or call 714-662-7940 ext. 7518.